All Battery Tender battery chargers are designed to fully charge and maintain a wide range of styles of lead acid batteries in ways that avoid the potential damaging effects that can be caused by most trickle chargers. All Battery Tender battery chargers have the five following characteristics: Fully Automatic, At the end of the regular charger cycle, every Battery Tender battery charger automatically switches its output voltage to a safe, storage or float level that eliminates the need to constantly check on the conditions of the battery. Battery Tender battery chargers will deliver full output power with input AC line voltages as low as 90 VAC. (Excluding chargers with output current of 2 amps or less). Zero to Minimal Current Draw from Batteries: When the AAC power is disconnected, most Battery Tender battery chargers draw zero current from the battery. A few of the higher power models draw less than 1 milliamp from the battery. At any given power level, Battery Tender battery chargers offer some of the highest charging power density in the industry. Every Battery Tender battery charger has some combination of colored lights to indicate the progress of charging. Battery Tender battery chargers offer a variety of power levels: 7.5, 15, 70, 300 & 600 watts, maximum charge currents: 0.75, 1.25, 2, 3, 4, 6, 10, 15 & 20 amps, and nominal battery voltages: 6, 12, 24, 36 & 48 volts. Various charging algorithms are available to acommodate the wide range of lead acid battery styles: Flooded, Sealed, VRLA, GEL & AGM. Check with the factory for the combination of power, current, voltage and battery style that best meets your needs. 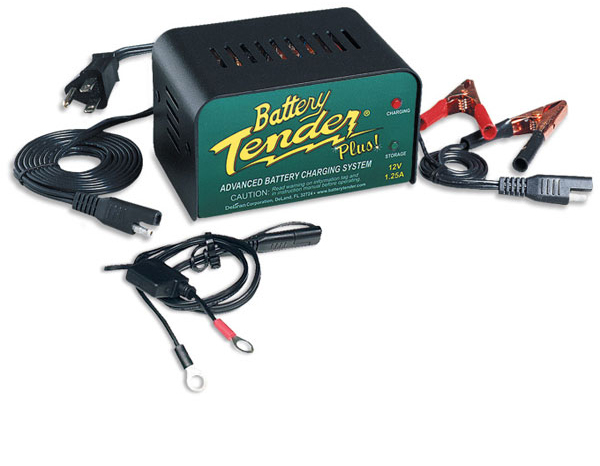 Battery Tender battery chargers are equipped with a variety of safety and interconnect options, not available on all models. Safety options include: spark free operation, reverse polarity protection and continuous short circuit protection. Interconnection options include: alligator clips, fused ring terminals and quick disconnect DC output cable harness. A variety of AC input power options is available.